Ramya Ghantasala ’15 performs a classical Indian dance called “Bharatha Natyam” during Asia Night 2013. Photograph by Michael Brady/Bates College. 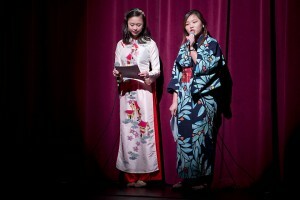 A Bates tradition since 2006, Asia Night may be formally designed as a celebration of cultures from Japan to Pakistan. But this show has another important purpose too: bringing color, excitement and plenty of laughs to campus in the depths of winter. The 2013 edition was short and sweet, about an hour. As in past years, the program combined dance, live music and displays of traditional apparel. 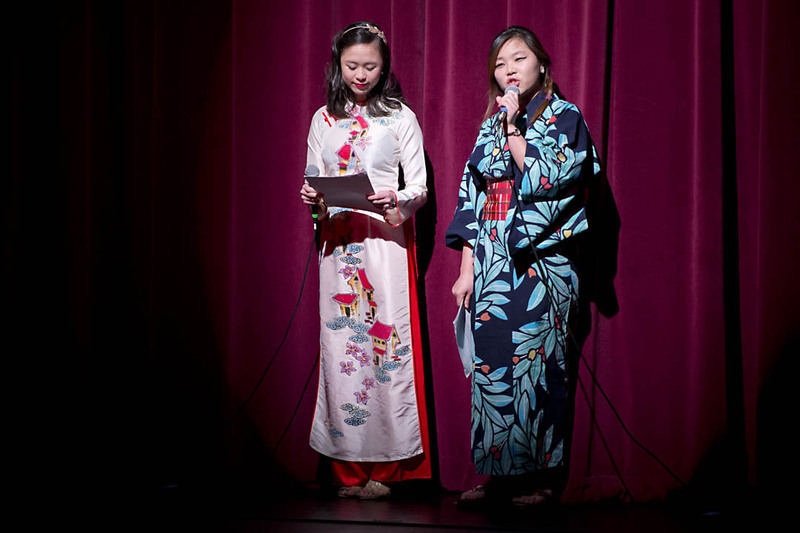 Asia Night 2013 emcees Michelle Pham ’15 and So Hee Ki ’16. Photograph by Michael Brady/Bates College. Stitching it all together was the tongue-in-cheek patter of Michelle Pham ’15 and So Hee Ki ’16, who worked the emcee stereotype for all it was worth. The show opened with a bang, literally, as the college taiko club pounded a battery of Japanese drums, blending stylized gestures and sheer sound pressure into a dynamic performance. “My heart is beating so fast it’s about to pop out of my chest,” Ki said afterward. “I completely agree, So Hee,” Pham responded. Like the taiko, a few other performances were familiar to the audience from last year’s program, including the high-voltage fishermen’s dance called “Soranbushi” from Japan; and a performance of classical Indian dance by Ramya Ghantasala ’15, who shows a profound mastery of this precise and intricately expressive form. 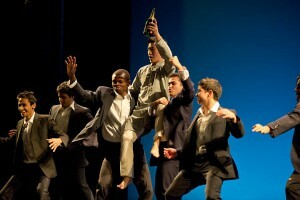 Dancer Erik Bou ’14 performing at Asia Night 2013. Photograph by Michael Brady/Bates College. Other high points included Book Chindakawee ’15, singing a Thai lament about an unrequited love, and vocalist Amna Ilyas ’13 and guitarist Adnan Shah ’15, performing “Musu Musu Hasi,” a song from India that looks back at old times. The short fashion shows, too, were key to the charm of the evening, combining cultural insights with laughs as the models — namely the male models — took the opportunity to exercise some ham. Lithe and athletic, Erik Bou ’14 offered an amazing pair of solo dances: a mostly traditional Cambodian “Monkey Dance” followed by thoroughly contemporary choreography set to a recorded spoken-word piece by Alexander Ou about a Cambodian-American family. Some things are common across cultures: Here’s the bachelor party segment from Asia Night’s “Great South Asian Wedding.” Photograph by Michael Brady/Bates College. Bates Masti, the campus Bollywood dance organization, wrapped up the evening with a ribbon and a bow in the form of “The Great South Asian Wedding.” This eagerly anticipated grand finale was a smashing medley of Bollywood dance numbers that, from betrothal to reception, was a triumph of passion, commitment and irresistible high spirits.